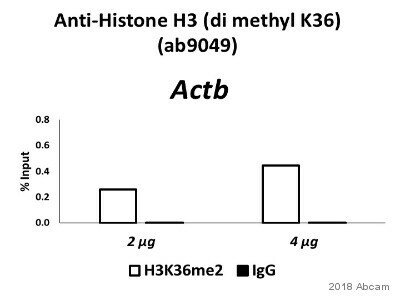 This antibody is specific for histone H3 di-methylated at K36. It does not react with mono or tri methyl K36. Synthetic peptide within Human Histone H3 aa 1-100 (di methyl K36) conjugated to Keyhole Limpet Haemocyanin (KLH). The exact sequence is proprietary. WB: Calf thymus histone preparation and HeLa whole cell extract. IHC-P: Human normal colon tissue. Our Abpromise guarantee covers the use of ab9049 in the following tested applications. WB Use a concentration of 1 µg/ml. Detects a band of approximately 17 kDa (predicted molecular weight: 15 kDa).Can be blocked with Human Histone H3 (di methyl K36) peptide (ab1784). 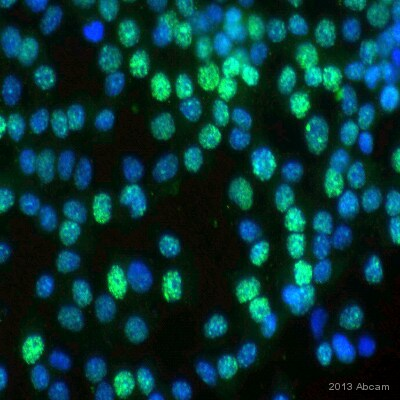 Chromatin was prepared from Hela cells according to the Abcam X-ChIP protocol. Cells were fixed with formaldehyde for 10 min. 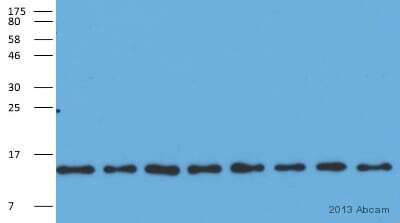 The ChIP was performed with 25 µg of chromatin, 2 µg of ab9049(blue), and 20 µl of Protein A/G sepharose beads. No antibody was added to the beads control (yellow). The immunoprecipitated DNA was quantified on the GAPDH and RPL30 (active) promoters and over the g-Actin gene (active). Schematic diagram of the g-Actin gene is shown on the top of the figure. Black boxes represent exons and thin lines represent introns. 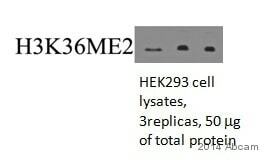 PCR products are depicted as bars under the gene. 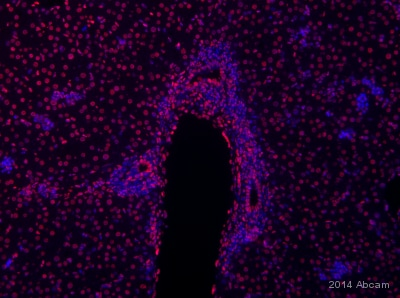 IHC image of ab9049 staining Histone H3 (di methyl K36) in human colon formalin fixed paraffin embedded tissue sections, performed on a Leica Bond. The section was pre-treated using heat mediated antigen retrieval with sodium citrate buffer (pH6, epitope retrieval solution 1) for 20 mins. The section was then incubated with ab9049, 1µg/ml, for 15 mins at room temperature and detected using an HRP conjugated compact polymer system. DAB was used as the chromogen. The section was then counterstained with haematoxylin and mounted with DPX. 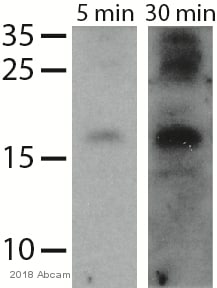 No primary antibody was used in the negative control (shown on the inset). ab9049 staining Histon H3 (di methyl K36) in Mouse Neuro-2a neuroblastoma cultured cells by ICC/IF (Immunocytochemistry/immunofluorescence). Cells were fixed with formaldehyde, permeabilized with 0.3% Triton X-100 and blocked with 1% BSA for 1 hour at 25°C. Samples were incubated with primary antibody (1/100) for 16 hours at 4°C. 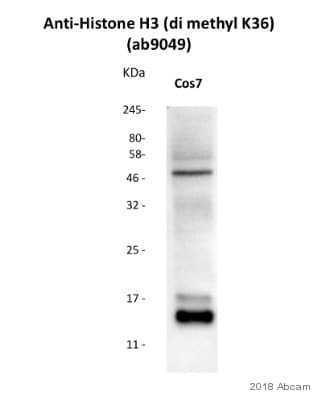 A FITC-conjugated Goat anti-rabbit IgG polyclonal (1/1000) was used as the secondary antibody. 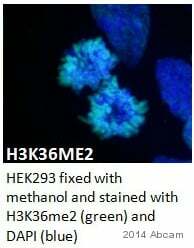 Immunocytochemistry/ Immunofluorescence - Anti-Histone H3 (di methyl K36) antibody - ChIP Grade (ab9049)Image courtesy of an anonymous Abreview. ab9049 staining Histone H3 (di methyl K36) in C elegans intestinal cells by Immunocytochemistry/ Immunofluorescence. Cells were fixed in paraformaldehyde and permeabilized using sperm salts buffer, Triton X-100. Samples were then incubated with ab9049 at a 1/200 for 16 hours at 22°C. A FITC conjugated goat polyclonal was used as the secondary at a 1/100 dilution. Counterstained with DAPI. 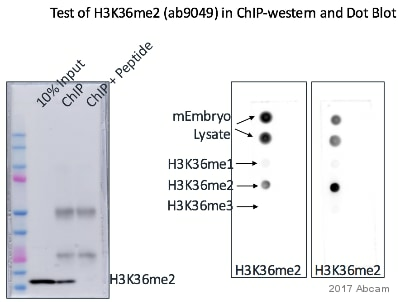 Western blot - Anti-Histone H3 (di methyl K36) antibody - ChIP Grade (ab9049)Image courtesy of an anonymous Abreview. Lysates/proteins at 50000 cells per lane. Observed band size: 17,42 kDa why is the actual band size different from the predicted? Publishing research using ab9049? Please let us know so that we can cite the reference in this datasheet.